“We talked about the necessity of further reform of the international financial system,” Medvedev said addressing the participants of the summit which has brought together Brazil, Russia, India, China and South Africa. “On this issue, as well as the volatility of global prices of agricultural products, we have taken a decision which reflects the consolidated position of the BRICS countries,” the president explained. He added that the set of concrete proposals will be discussed at the G20 summit in Cannes in November this year. The consequences of the devastating earthquake in Japan and the turmoil in North Africa were high on the agenda. 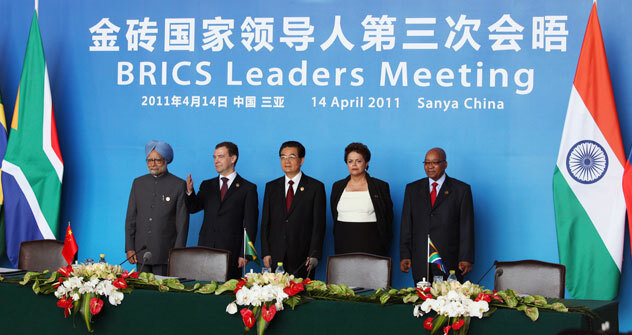 The BRICS leaders were unanimous in their stance on civil conflicts in African countries. “Our common opinion is that the problem should be settled by political and diplomatic tools and not by force,” the Russian president outlined. As for natural disasters and nuclear crises similar to what Japan has experienced, Russia has come up with an initiative to work out a mechanism of mutual aid in case of emergencies. “For more than a month, the eyes of the whole world have been on the tragic events in Japan. Russia and the other participants of the forum once again express their empathy to the Japanese people and government,” Medvedev said.